National Frozen Food Month is here, meaning now’s the perfect time to hit up the frozen food aisle to try something deliciously different and hassle-free. Whether you’re a confident cook who enjoys trying trendy flavors at home or someone who prefers quick-and-easy meals with minimal prep, the frozen food aisle is an excellent place to find healthy, delicious meals year-round. And, frozen products are great to have on hand when you’re looking to add a sense of mindfulness and calm back into your everyday. Luckily, your favorite shrimp brand, SeaPak, has you covered with the launch of two new Asian-style soups. 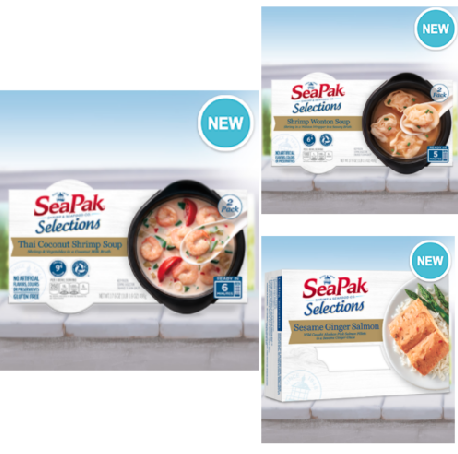 Ready at the press of a button, SeaPak Selections Shrimp Wonton Soup and Thai Coconut Shrimp Soup are the brand’s first-ever soups and a great addition to their meal solutions lineup. They are microwaveable, and unlike many of their non-frozen counterparts, these quick-and-easy, heat-and-eat bowls of goodness contain no artificial flavors, colors or preservatives. They’re also gluten free and made with responsibly sourced shrimp. Thanks to the fact that they require virtually no prep work, SeaPak’s new products are tried-and-true time-savers, giving you two new reasons to shop the frozen aisle during your next shopping trip. The best part? These ultra-convenient soups are ready in just 6 minutes, giving you more time to chillax and enjoy what matters most.